Next Article Did Suffragettes set fire to yacht? Mr Breingan was a local dignitary and Provost from 1863-69. In that role he and Sir James Colquhoun of Luss supported a move by William Kidston to acquire what is now Kidston Park from the Duke of Argyll and lay it out as a park. The cost was £552 — £320 per acre — and included the rights to the foreshore and the mussel beds, but the Duke retained the right to land from and embark to the Castle of Rosneath. He himself was a Trustee of the Helensburgh Penny Savings Bank. His Trustees presented a field at Suffolk Street to what became Helensburgh Lawn Tennis Club in 1884, while on May 27 1892 the Edinburgh Gazette carried an announcement from Alexander Williamson’s trustees, Ebenezer Hendry and Alexander Breingan, that the Queens Hotel had been sold to Mr. Augustus Schnake. In 1899 as a banker he was appointed a liquidator of the Helensburgh Gas Company Ltd. Even from a quick search it is obvious that he was clearly a local politician and businessman with his finger in quite a few pies. Donald Macleod, in his book ‘A Nonogenarian’s Reminiscences of Garelochside and Helensburgh’, which was published in 1883 and based on what he was told by his uncle, Gabriel Macleod, devotes two pages to his double term as Provost. He wrote that there had been no man so popular and so universal a favourite in the burgh, either in or out of office, as Provost Breingan. Clearly a fan, he continues: “His life has been a busy one, and his energies have been directed to the welfare of the burgh of which he is a native. “Its interests have always been the first consideration with him, and he has grudged neither time, money nor energies to promoting its welfare. He saw the advantages which the burgh would gain by the adoption of the General Police Act of 1862 in providing a better system of management than possible under the local Police Act. He showed his fighting qualities when he proposed a controversial but much-needed new water supply scheme for the burgh. The population had risen from 3,000 in 1851 to 5,000 in 1861, and it was rapidly increasing. The water was drawn from shallow wells and two natural springs, but the well proprietors rebelled against and ridiculed the water scheme. At a public meeting the plan was condemned and denounced, and utter failure was prophesied. But Provost Breingan fought on, and on March 26 1868 the Mains Hill Reservoirs and filter works were formally opened. The Provost, magistrates, and council members processed through the town, preceded by a band, the Artillery and Rifle Corps, the local lodge of Oddfellows, and the Dumbarton lodge of Oddfellows. Many local residents walked alongside on the way to the filter house, where Mrs Breingan opened the water taps and her husband declared the work complete. A dinner in the Queen’s Hotel followed. He was always interested in agriculture, and had extensive knowledge of farm produce, often acting as a judge in nearby agricultural shows. He was also prominent in local education, serving four times as chairman of the School Board of Row, and he promoted education by using his own money to founding bursaries for promising pupils. He was one of the earliest members of the County Volunteer force, and he worked hard to improve the efficiency of the company with which he was serving. Townsfolk clearly agreed, and on January 27 1870, as a token of the highest esteem in which he was held, presented him with an ornamental dining room centrepiece. The presentation was made by chairman James Stirling of Rockend at a dinner at the Queen’s Hotel attended by over 100 gentlemen. He was involved from the beginning in August 1893 with the formation of Helensburgh Golf Club. A large number attended the inaugural meeting in the Court Room of the Municipal Buildings when the ex-Provost was called to the chair, and he expressed the hope that the meeting would result in steps being taken to form a golf club. William Lunan, who with Gordon Gemmill had called the meeting, suggested that the ex-Provost be the first club captain because of his enthusiasm for the sport, and also because of his track record in bringing to a successful conclusion all things he took up. This was greeted with applause. The official opening of the hilltop course took place on May 5 1894. The vice-president, ex-Provost John Mitchell, said the epidemic of golf fever sweeping the country had now reached Helensburgh. He introduced the captain by asking if, for the last half century, there had been any improvement to the town which he had neither done himself nor assisted in, and he presented to Mrs Breingan an inscribed cleek with which she was to hit the opening shot. It was reported that “she cleverly drove off the ball amid the cheers of the spectators”. Her husband congratulated the community on their efforts and revealed that he had taken up the game only the previous year, but he assured all that no-one took a deeper interest in the club than he did. After announcing that he would be donating a gold medal for annual competition, he then led his captain’s team to victory over the vice-president’s team by 13-11, securing the victory by beating ex-Provost Michell by one hole. He served as captain from 1893-4, and as president for one two-year term. He was married twice, first to Margaret Masterton, who died from heart failure in 1885 at the age of 65, and then from 1891 to widow Catherine Lillias Clark Forrester, who died in 1910 aged 74. 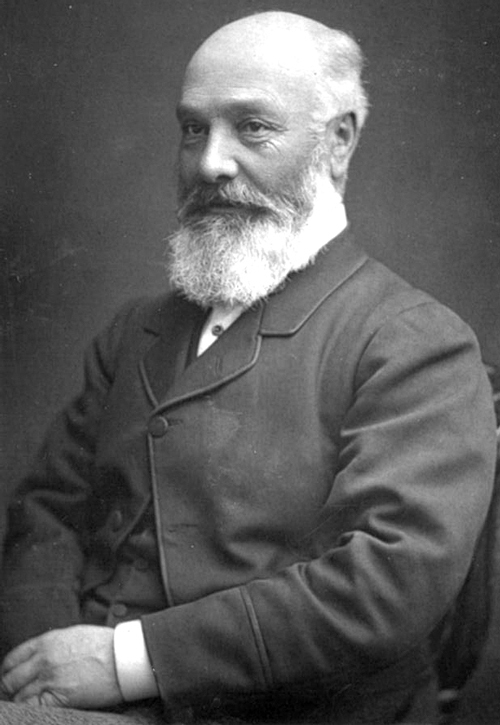 Alexander Breingan died on March 20 1900 at the Bank of Scotland where he lived and worked, aged 75. In 1902 a bandstand was built on the seafront close to the Granary as a memorial. It was known as Breingan’s Bandstand, and it was a popular meeting place for courting couples until it was demolished to make way for the swimming pool car park. 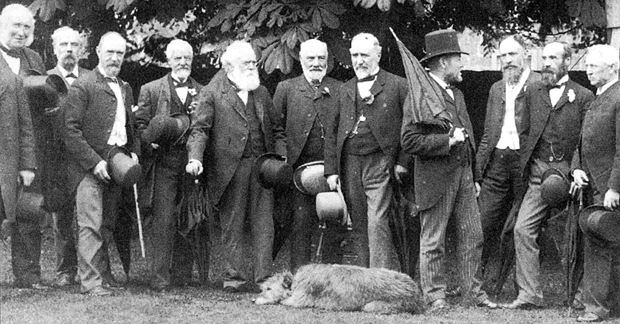 Ex-Provost Alexander Breingan (sixth from left) with other founder members of Helensburgh Golf Club.